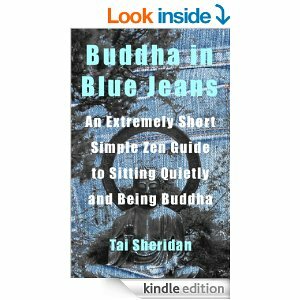 I spotted a free Kindle book available today on Amazon: Buddha in Blue Jeans: An Extremely Short Zen Guide to Sitting Quietly and Being Buddha by Tai Sheridan. It’s a really short read (31 pages) if you are interested in learning more about living mindfully. I would recommend this book to anyone who is looking for healthful ways to stress-less and to be more present. A wonderful, quick weekend read! This entry was posted in Awakening, Conscious Living, Freebies, Japanese Psychology: Morita and Naikan Therapies, Meditation, Mindfulness and tagged Buddha in Blue Jeans, Buddhist, Free Kindle Book, Tai Sheridan, Zen. Bookmark the permalink.